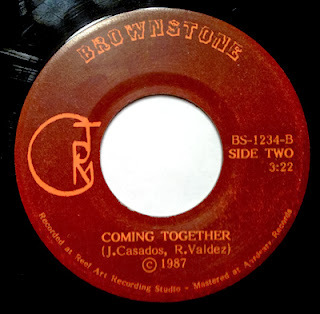 Take a listen to this record ("Coming Together" and the flip "Surrender"). Any guesses on the year? Go ahead, guess. If you were like me, I was thinking late 1960s, with the Byrdsy guitar and the folky psych vibe. The group Brownstone recorded this ridiculously catchy albeit head scratcher in (wait for it) 1987. Yeah, I know. Crazy, huh? I'm sure someone will enlighten me on the history of this single. Recorded at Reel Art, I contacted the folks at Aardvark, where it was mastered, and nary a word. Only other hints are J. Casados and R. Valdez.